Not only Apple devices can be erased and tracked remotely, also Android! So the following steps will help you setup your device via "Android Device Manager" so you can delete, lock and trace your precious device in case you lose it or someone steals you. If any of this has already happened, you can use this application to block and track your device immediately but only if you had a gmail account. If you do not have a Google Gmail account, you must create one. 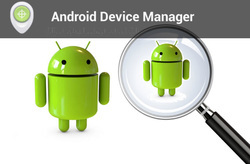 Download the app or computer search: Android / DeviceManager. Enter your Gmail and your device will appear with a menu and map. From the menu you can choose Ring, Block and Delete. You can choose Block and write a message on the screen. The message will appear on the device and no one can use it. If you need help to setup your device you can visit me at the shop. HOW MUCH DO YOU PAY FOR MY DEVICE?